The Bristol Active Life Project (BALP) offers sessions across Bristol for people who’ve experienced or are living with long-term mental illness and are unable to access mainstream activities due to their mental health. BALP sessions include badminton, football, gym based exercise, walking, women’s yoga and tai chi. 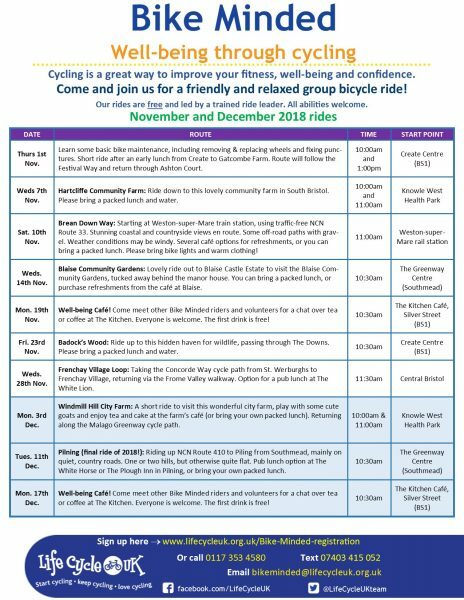 The November and December 2018 programme of bike rides for adults who want to improve their physical and mental well-being is now available. We’ve got a nice mix of rides in the run-up to Christmas, several of which are aimed at beginners or people returning to cycling. New riders can sign up online; alternatively, I am very happy to come and meet anyone who is interested in joining our cycling community! We’ll be cycling the Brean Down Way, visiting Blaise Community Gardens and spending some time with the goats at Windmill Hill City Farm. We have our Well-being café at The Kitchen on the third Monday of every month from 10:30am to midday. Everyone is welcome, and your first tea or coffee is free! Ride On Ride Out’s (RORO for short) aim is to bring the joy and freedom of cycling to those who, through disability, stroke, or mobility issues, would otherwise be unable to go out for a ride. Offers a wide range of free courses and workshops for people living in Bristol including sessions on Confidence Building, Mindfulness and Building Resilience. Courses focused on helping people with their recovery by providing opportunities to learn new skills, make new friendships, build confidence and inspire others. Walking for Health Bristol is an initiative which supports Bristol’s diverse communities to become more active through walking. Walking is the most accessible form of physical activity with many physical and mental health benefits. It’s also a great way of getting to know your local neighbourhood and making new friends. Anyone of any ability wanting to get more physically active in a safe, enjoyable way.